What do you get when you combine two of the best things on the planet, the Instant Pot and cheesecake? You get this post — 15 Instant Pot Cheesecake recipes! Nothing is more delicious than a bite of yummy cheesecake after slaving over dinner. If you’re in the mood for cheesecake but don’t want to head to the store, don’t worry! These cheesecake recipes taste so much better than a bakery, and you can make them in just a few minutes! Here are the best Instant Pot cheesecake recipes out there. You’ll love this list of 15 amazing Instant Pot cheesecake recipes! This recipe produces a creamy 6-inch New York style cheesecake. The post also includes a lot of great Instant Pot cheesecake tips! This incredible Instant Pot cheesecake is a peanut butter chocolate chip with a crust made out of Oreo cookies. It’s topped off with a chocolate ganache and chopped peanut butter cups. A sweet and flavorful cheesecake that’s low in carbs? You bet! This cheesecake uses Swerve, a low-carb sweetener, to seriously reduce the grams of carbs in the recipe. Never heard of Japanese Cotton Cheesecake? It’s a cheesecake that uses only three ingredients: cream cheese, eggs, and white chocolate. Use this recipe to make it in the Instant Pot. Fudge on the bottom, creamy cheesecake in the middle, and a cherry compote on top. Yum! No Instant Pot cheesecake recipe round-up would be complete without a recipe for Instant Pot Key Lime Cheesecake. This recipe is a great one! This recipe will produce an unbelievably decadent 7-inch Salted Caramel Cheesecake. This cheesecake was inspired by Caramel DeLites/Samoas Girl Scout cookies. Not only does it taste like the classic cookies, but it looks like them too! An Oreo crust, a sweet and creamy cheesecake, and a topping made out of whipped cream and crushed Oreos. What more can you ask for in an Instant Pot cheesecake recipe?! The crust for this Instant Pot cheesecake is made from ginger snaps and pecans… yum. It has been shared almost 30,000 times on Pinterest, and it’s easy to see why! This Instant Pot cheesecake recipe is a trifecta of chocolate: chocolate crust, chocolate cheesecake, chocolate topping! If you want a bit less chocolate in your chocolate cheesecake, try this recipe! It’s chocolate cheesecake with a graham cracker crust. This raspberry cheesecake is another one covered with a chocolate ganache — this time topped with fresh berries. Last but certainly not least in the Instant Pot cheesecake recipes list is this incredible mint cheesecake with an Oreo crust! Have You Tried Instant Pot Cheesecake? Have you tried Instant Pot cheesecake? What’d you think? 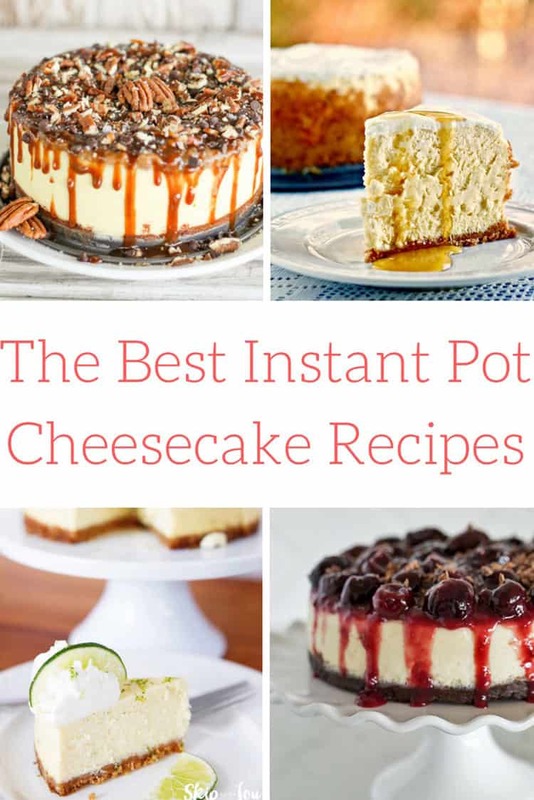 I’d love to hear about your favorite Instant Pot cheesecake recipes (hopefully a few from this list)!